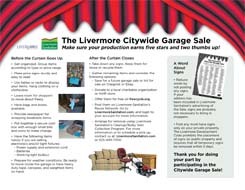 The Livermore Citywide Garage Sale is scheduled for Saturday, June 15, 2019 from 8am to noon. Register your sale here or over the phone at 925-449-7300. Register by June 6, to receive free advertising. Save the date and get your reusable shopping bags ready! For a complete list of participating addresses, check the June 13 edition of the Independent. LIST OF SALE LOCATIONS COMING SOON!! Click here for our Guide to a Successful Garage Sale.